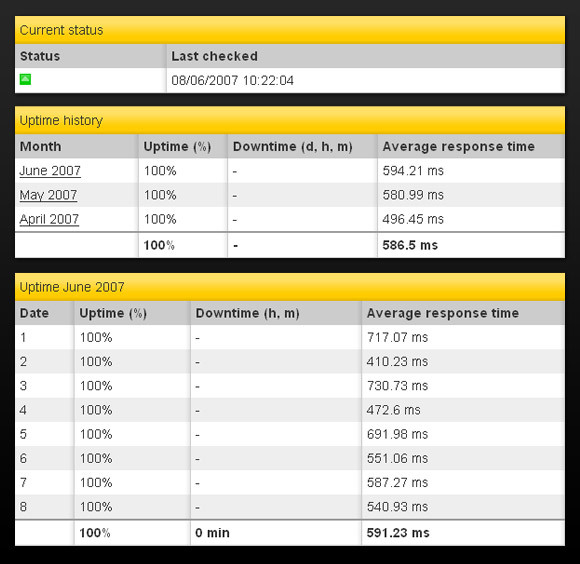 Pingdom customers can now easily display their uptime statistics to the public. With just a few clicks you select what you want to show, and Pingdom automatically creates a public report page for you. You will then have a URL you can link to, hosted by Pingdom, with your uptime history always available. Why use public report pages? The simple fact that you are showing your uptime history publicly is an indication that you are open and honest. It’s reliable information from a third party. Pingdom is the source, not you. You can also use it as a status page for when your own site is down, even though it’s foremost meant as a means to show your uptime history publicly. Web hosting companies – Prove that you really DO have 99.9% uptime. Websites that sell advertising – Prove to advertisers that your website is reliable. Advertising networks – Prove that you can deliver ads reliably 24/7. Web applications – Prove that your customers can access your site at any time. You may notice that the keyword here is proof. What better way to prove that you are reliable than having a third party such as Pingdom monitor your uptime? All you need is a standard Pingdom account. Activating the public report pages will take less than a minute, and there is no extra cost involved. In the Pingdom control panel, select Public Reports in the menu. Select the checks you want to show publicly. Click on the Update button. That’s it! Your public report page is now up and running. Your unique public report page URL is shown at the top of the page. Note that you can at any time edit which checks are shown publicly. Below are a few partial screenshots from a public report page. Want to see the real thing? Here is a report page for www.pingdom.com.